Valentine's is one of my favorite holidays. An good excuse to say "I care", I actually like to focus on friends and family on this day for I think its important to take the time to say "you mean so much to me" to the important people in your life versus getting caught up in the romantic aspect of the occasion. Another reason I love this day is that I am also a totally sucker for the design element of this holiday. The pink, the red, the candy and who can forget the FLOWERS! Thus this year, I wanted to give my floral love a twist, using flowers as an outfit accessory rather than just something to get and give. It was so much fun to partner up with local flower shop Petite Petal Co. for this easy peasy DIY project. If your looking for a last minute Valentine's hair hack this is a simple and sweet way to accessorize your look! See full DIY steps bellow. * The diameter depends on how large your flower is. If it’s big then the circle should be bigger. 1. 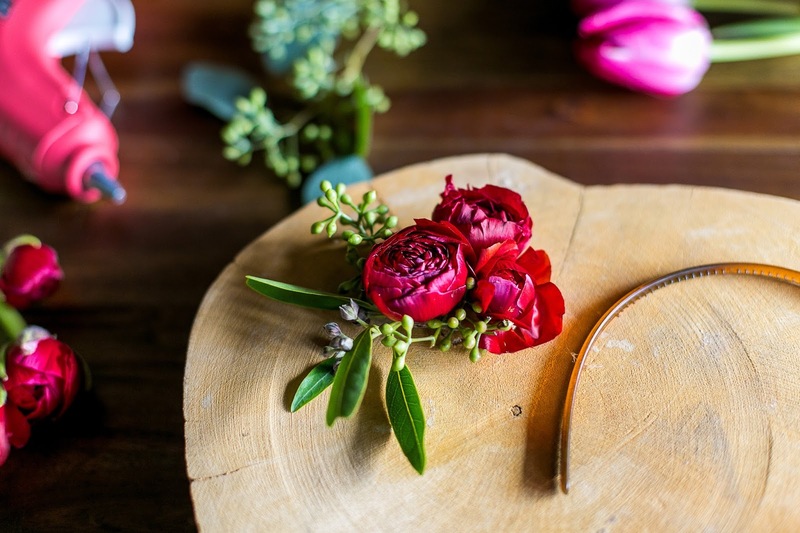 Prepare your flowers and greenery: Cutting flower(s) head(s) down so there is no stem and trim your green foliage to the length you would like. Play around with the layout. This is essential for hot glue dries fast and the arrangement will not be able to be tweaked once glued. 2. Attach foliage to cardboard circle: Take the cardboard circle and place hot glue where you want your foliage to lie. Arrange and place foliage on top of the glue. Allow glue to dry. 3. Attach flowers to cardboard circle: In the center of the cardboard circle place hot glue where you want flowers to lie. Arrange and place flower(s) on top of the glue and hold it down securely. Allow glue to dry. 4. 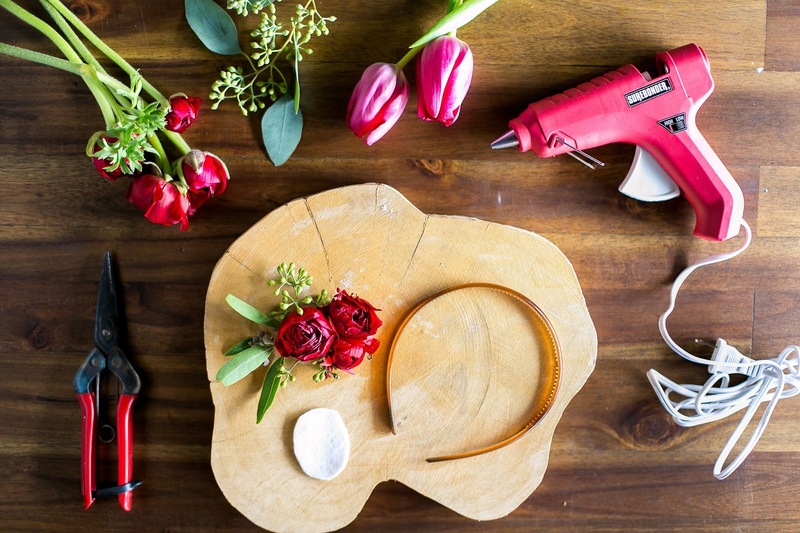 Prepare Headband: Take your headband and decide where you want to place the flower cluster. Once again note that this is essential for hot glue dries fast and the arrangement will not be able to be tweaked once glued. 5. 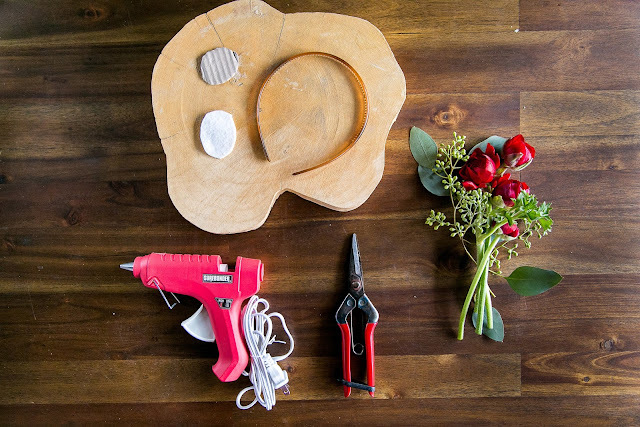 Attach flower cluster to the headband: Dab a generous amount of hot glue to the back of the cardboard attaching it to felt circle, while sandwiching the headband in between. Secure tightly. Add some more hot glue to get the edges if necessary. Allow glue to dry. Petite Petal Co. is having a variety of Valentine's floral bouquets you can shop at its just launched fab flower shop so make sure to pass by and pick up a bunch for a loved one or simply... Treat Yo Self! !